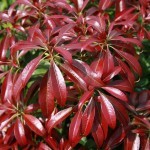 A rounded shrub with large glossy foliage that is a striking wine red when young. The leaves age to dark green. The drooping clusters of early spring flowers are rose-pink. 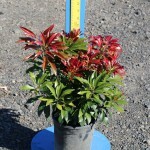 Takes full sun to part shade, but needs cool, moist soil. 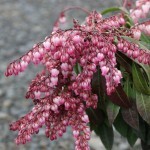 Use in the shrub border, as an informal hedge, or as a specimen. PP 15,452.